Chocolate Lab puppies share the same traits as other Labrador puppys in that they are so adorable they can melt the heart of anyone. Their unusual colour, and they are the less common of all the three Labrador coat colour types, really makes them stand out. And, when they grow to maturity, they make really stunning dogs and, of course, wonderful companions. Chocolate Lab puppies are hugely popular due to their beautiful colour, rich appearance and wonderful temperament. Supporters of these Labrador puppys claim they are much easier to train than other types of lab but there certainly isn't any genetic reason why that should be so. After all, they are the same breed, just a less usual colour, than yellow or black Labrador Retrievers. As a breed Labrador Retrievers are generally easy to raise and handle and don't suffer from the negative inbred attitude problems that other breeds have. Labradors have been one of the most popular breeds of dogs for many years and that will continue into the future as they are the ideal family dog; friendly, loyal and a bundle of fun. And chocolate Lab puppies are no exception to that and are equally at home playing with the family or strutting their stuff in a show. 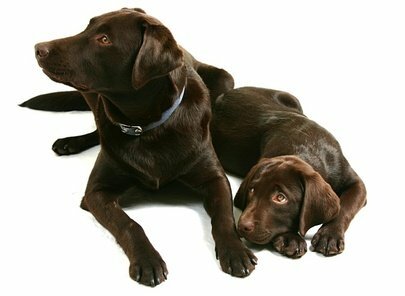 Chocolate Lab puppies, indeed they often do well in shows as they are strongly built dogs with good bone structure, broad heads and soft, intelligent eyes and make very proud and distinguished pets for their owners. Although referred to as 'chocolate' the colour of the coat is actually classed as brown by the Kennel Clubs of America and the UK though I must say I have never heard a Lab owner refer to their dog as being brown in colour. So, are there any downsides to those lovely Labrador puppys? Labrador Retrievers do take an awful lot of looking after simply because of their natural sense of fun and adventure. If you thought keeping an eye on a toddler was tough wait until you have Labrador puppys running around the house! To me though that is a positive rather than a negative. There is never a dull moment when you have a loopy Labrador or two causing havoc in the house. The only real downside I can see is one that could apply to many breeds of dog. They do shed their coat a lot and if anyone in the house has allergies than this is obviously a major issue and a Lab, no matter how adorable, should not be brought home. Apart from the coat shedding issue chocolate Lab puppies make the ideal pet and will give their owners years of fun and devotion.